• The 36th annual Portland Rose Festival Art Show takes place through June 26 at the Oregon Society of Artists, 2185 S.W. Park Place. For more: oregonsocietyofartists.com. The Oregon Society of Artists is one of the longest running Rose Festival partners. • Ships and sailors abound in the Rose City this weekend as Fleet Week continues through Sunday, June 10. There are ship tours daily. Ships scheduled to be in port: U.S. Navy — USS Michael Murphy (DDG 112), USS Independence (LCS 2), USS Scout (MCM 8); U.S. Coast Guard — USCGC Steadfast (WMEC 623), USCGC Bluebell (WLI 313), USCGC Orcas (WPB 1327); Royal Canadian Navy — HMCS Regina (FFH 334), HMCS Nanaimo (MM 702); T/V Ironwood; Sternwheeler Portland. • The Portland Rose Society's 130th annual Spring Rose Show displays hundreds of locally grown roses in a colorful contest, 1-9 p.m. Thursday, June 7, and 10 a.m-5 p.m. Friday, June 8, at 2201 Lloyd Center. For more: www.portlandrosesociety.org. • The Royal Rosarians Honorary Knighting Ceremony will be held at 9:30 a.m. Friday, June 8, at Peninsula Park, 700 N. Rosa Parks Way. It'll fete Amy Roloff, founder/CEO of Amy Roloff Enterprises (and from reality show "Little People, Big World"), as well as National Cherry Festival president Ian Hollands, Astoria Regatta Association President Julie Flues and Apple Blossom Director General Andy Kottkamp. It's the 106th year of the Honorary Knighting Ceremony; Prime Minister Adam Baker and 2017 Queen of Rosaria Michaela Canete will preside. The 2018 Rose Festival Court princesses also will be in attendance. n CityFair is going to be fun and busy from 11 a.m.-11 p.m. Friday-Sunday, June 8-10, at Waterfront Park. Activities include Kids Zone, 11 a.m.-1 p.m. June 9; the Grand Floral Scavenger Hunt on June 9; Goat Yoga, 11 a.m. June 10; Funtastic Traveling Shows and more. • The Queen's Coronation takes place at 8:30 a.m. Saturday, June 9, at Veterans Memorial Coliseum. It's a 100-plus-year tradition that's still going strong, as Portland celebrates its ambassadors of goodwill. The princesses are Lux Preciado-Solis, Lincoln; Kash'lmani Thomas, Jefferson; Melissa Torres-Duran, Grant; Jennifer White, St. Mary's; Alanesia Vang, David Douglas; Madison Nieuwendorp, Roosevelt; Stephanie Vo-Nguyen, Madison; Amaya Gustave, Franklin; Anna Kien, Wilson; Sydney Toops, Cleveland; Mariamou Abdoulaye, Benson; Maya Bedge, Westview/Metro West; Caitlin McCabe, West Linn/Metro East; and Kiara Johnson, Parkrose. • The Grand Floral Walk precedes the festival's biggest event, as the four-mile walk, meant to promote healthy living and community fun, takes people along the Grand Floral Parade route. It starts at 9:30 a.m. June 9 at Veterans Memorial Coliseum. 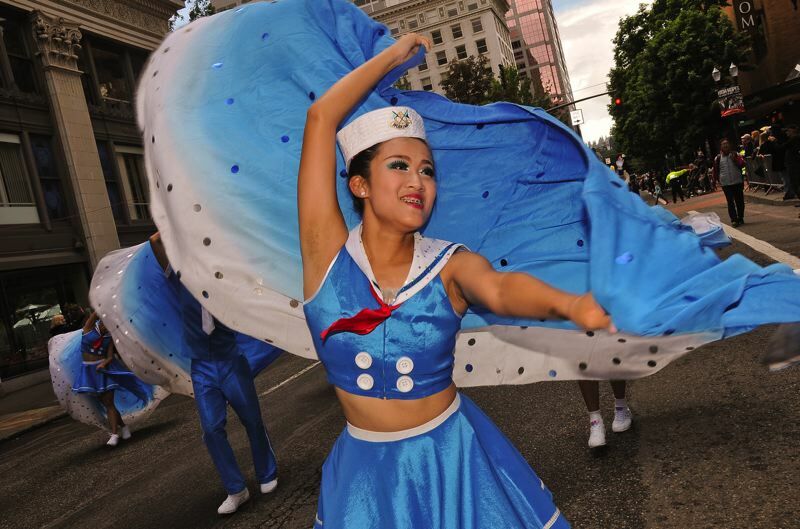 • One of the biggest all-floral parades in the country, the Spirit Mountain Casino Grand Floral Parade, the festival's marquee event, showcases cultures with colorful costumed dancers, marching bands and floats of many sizes. It starts at 10 a.m. June 9 at Veterans Memorial Coliseum and will include the new Queen of Rosaria. • On the Willamette River off Waterfront Park, there'll be Dragon Boat Races, featuring 50 teams of competitors and their ornately carved traditional dragon boats racing to capture the flag, 8 a.m.-5 p.m. Saturday-Sunday, June 9-10. For more: www.pksca.net. • The Grand Floral Float Showcase, post-parade, provides fans an up-close view of the floats, 3-10 p.m. Saturday, June 9, and 11 a.m.-4 p.m. Sunday, June 10, at a spot adjacent to CityFair on Naito Parkway. • For complete info: www.rosefestival.org.